Truck driver Jacob Aaron Cartwright, 22, went missing Tuesday in Eastern Oregon. 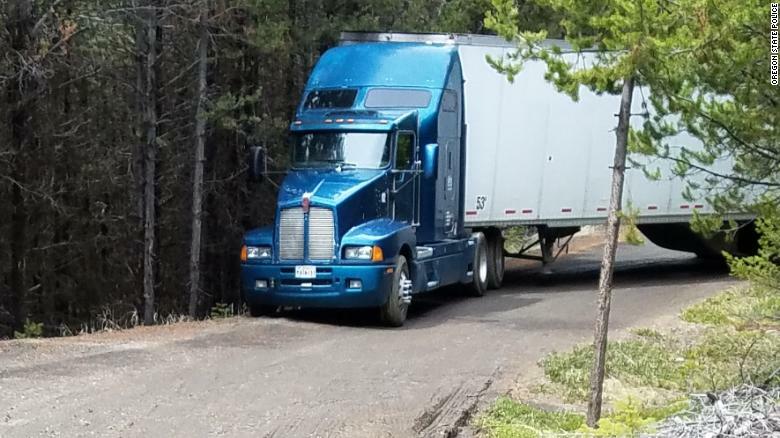 (CNN) When Oregon truck driver Jacob Cartwright first set out on Tuesday to deliver a shipment of potato chips, he never expected to emerge from the wilderness four days later — on foot. And, despite being lost in the woods, the 22-year-old didn’t touch the chips he was transporting, said his boss, Roy A. Henry, the owner of Little Trees Transportation. Cartwright had been driving from Portland to Nyssa, Oregon, a town near the Idaho border, trying to make a delivery by 7:30 a.m. on Wednesday, CNN affiliate KATU reported. But his GPS system sent him up the wrong road and into a “remote and mountainous location,” the Oregon State Police said. Henry said Cartwright entered the wrong address, but because he’d never been in that town before, he couldn’t tell whether he was going the right way or not. He continued following the GPS, not knowing he was going the wrong way. It was the middle of the night at that point, Henry said, and Cartwright had missed three opportunities to turn around. Once Cartwright finally decided to try and turn around, police said the 18-wheeler began sliding toward a steep embankment and got stuck on the snowy and muddy road. With no cellphone signal, Cartwright began walking back along the road he was driving on and at some point began walking through the forest to find someone to help him free up the truck, Henry said. State police searched for Cartwright and the truck during the four days he was missing. “Luckily it wasn’t snowing last week, it was very warm last week,” Henry said. “He was so dehydrated that his kidneys stopped functioning,” Henry said, adding that Cartwright also had possible frostbite in his right foot. Henry said he joked with Cartwright about having a truck full of chips and wondered why he didn’t eat any of them.